In this tutorial, we will demonstrate how to write a high performance convolution implementation in TVM. We use square size input tensors and filters as an example, and assume the input to convolution has a large batch. In this example, we use a different layout to store the data in order to achieve better data locality. The buffer layout is HWCN, which stands for height, width, channel, batch. We use the fixed size for input tensors with 256 channels and 14 x 14 dimensions. The batch size is 256. Convolution filters contain 512 filters of size 3 x 3. We use stride size 1 and padding size 1 for the convolution. The following code defines the convolution algorithm in TVM. We first specify the memory hierarchy for buffers. 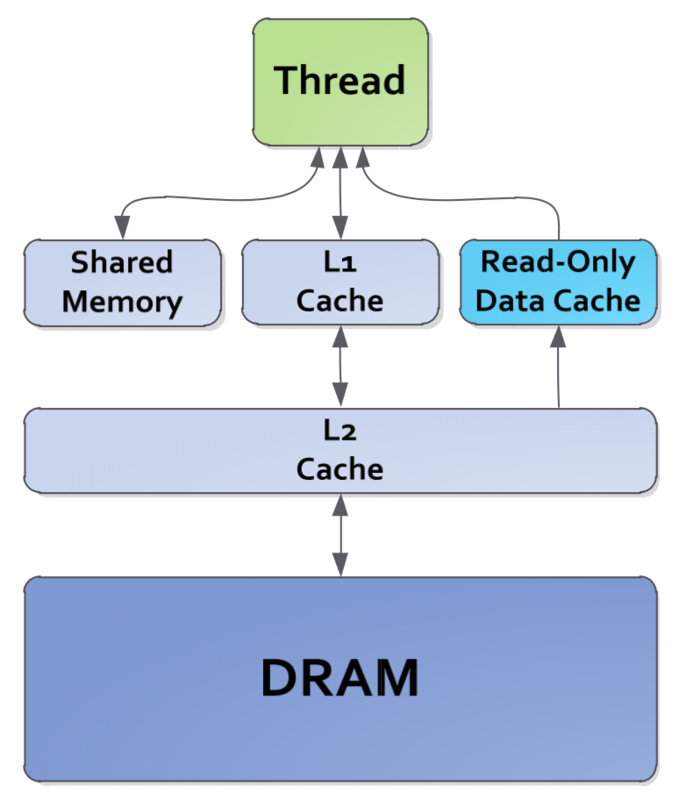 The figure below shows the GPU memory hierarchy. One important difference from CPU memory hierarchy is that GPU provides a cache buffer called shared memory, which is managed by programmers. Thus how to maximize the data reuse in the shared memory is critical to achieve high performance in GPU kernels. In this example, we load both Apad and W into buffer AA and WW, which are stored in the shared memory. These bufferes will be later shared by all threads within the same thread block to compute the convolution. Each thread then loads its own part from shared buffer into their local registers, AL and WL. BL is a local cache of output B, which is also stored in the thread local registers. The following code splits the workload into thread blocks and individual threads. We follow the blocking scheme in the matrix multiply. 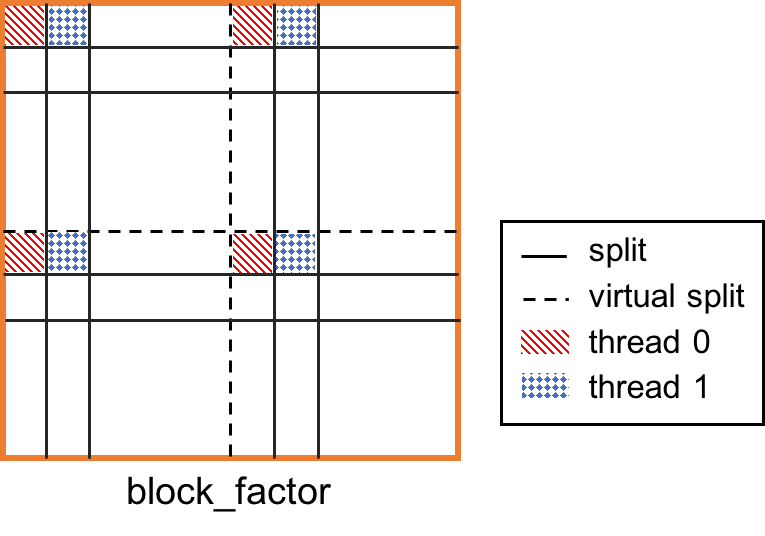 As shown in the figure below, given a pixel coordinate (y, x), a thread block is responsible for computing a region of block_factor x block_factor (64 x 64) for output channels and batch. 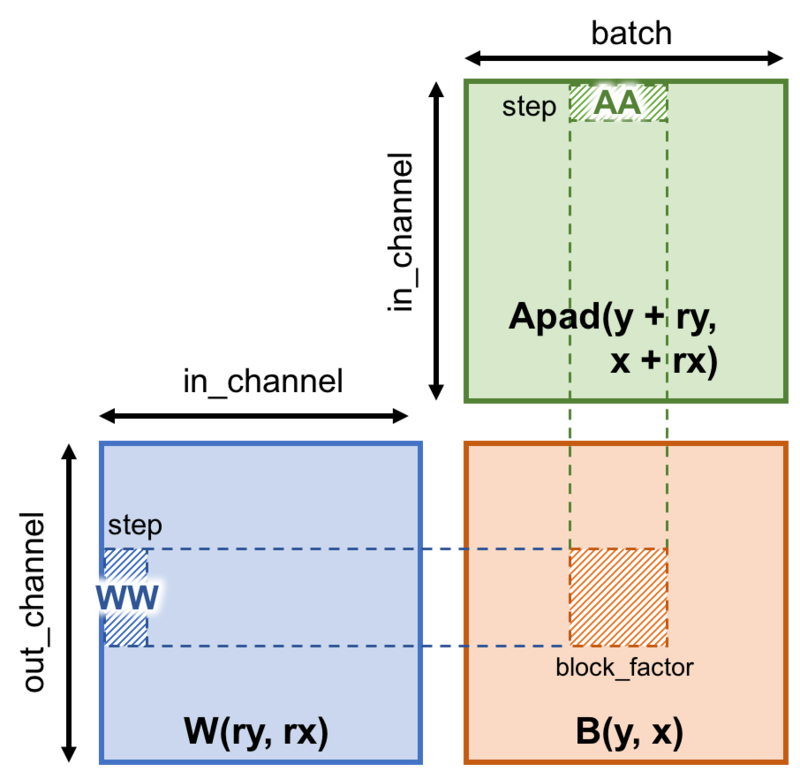 Due to the limit of shared memory space, we only load step x block_factor (8 x 64) data from Apad and B each time to buffers in the shared memory. We further split the workload from a thread block to individual threads. To avoid memory bank conflict, we use virtual thread to split the area into 4 parts, and then tile into 8x8 grids. Therefore, shown in the figure below, each thread computes 4 strided grids, where size of each grid is 4 x 4. As mentioned before, each time step we need to transfer step x block_factor data from GPU global memory to shared memory. In order to reduce the memory transfer per thread, the following code lets threads in the same thread block coopertively fetch dependent data from global memory. Finally we use TVM to generate and compile the CUDA kernel, and evaluate the latency of convolution.